D181 is not on list of top 100 school districts. D86 is. Dawn Benaitis, Director of Learning (Curriculum & Instruction), resigns from the District effective end of day June 30, 2016. Feel free to SOUND OFF! So what do these results show? As noted above, we are not trained in analysis of election results, so our reflections are, in our opinion, more "common sense" observations that we -- D181 parents and taxpayers and community members -- are making. We'd love to hear what the rest of you think about the results -- remembering to be mindful that the comments should be constructive and focused on what needs to happen in order for any future D181 referendum to be successful -- so as always SOUND OFF! We will begin by pointing out that the HMS Referendum lost by 1,147. That is a significant number. There are a total of 32 precincts. D181 voters in Dupage County reside in either Downers Grove Township or York Township. Those in Cook County reside in York Township. Elm, Lane, Oak and Madison Schools are the feeder schools for Hinsdale Middle School. Monroe, Prospect and Walker are the feeder schools for Clarendon Hills Middle School. The majority in FIVE of the seven feeder schools' precincts voted NO to the referendum. This majority included voters in the Elm and Lane boundary areas. The NO votes in the Elm and Lane boundary areas exceeded Yes votes by a relatively slim margin, but what cannot be ignored is that 1601 voters in these two HMS feeder areas did not support building the new HMS as proposed in the referendum -- that is nearly 30% of the NO votes that swung the decision. 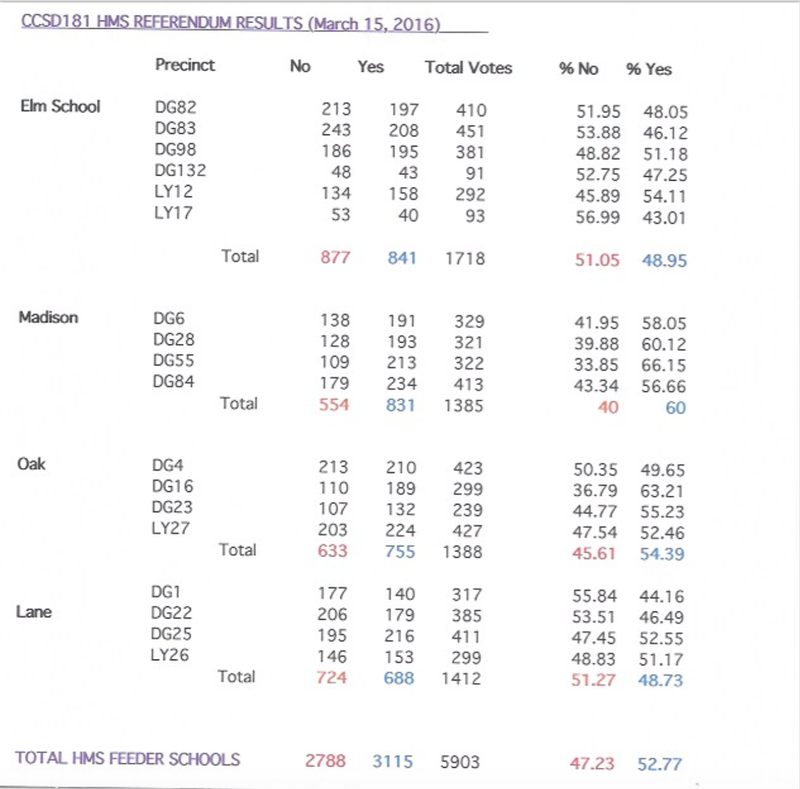 Even in the two HMS feeder schools that had a majority of voters vote YES, a total of 1187 people voted NO. This means that 2788 people in the HMS feeder districts did not support the referendum question to build a $65 million ($90 million with bond interest) replacement school and tear down the existing 40 year old school. 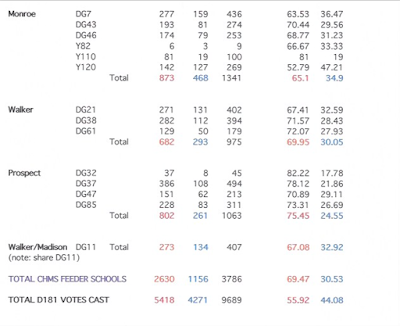 But what is most significant is that the combined NO votes from the HMS feeder schools' precincts made up 51.5% of the total NO votes cast. 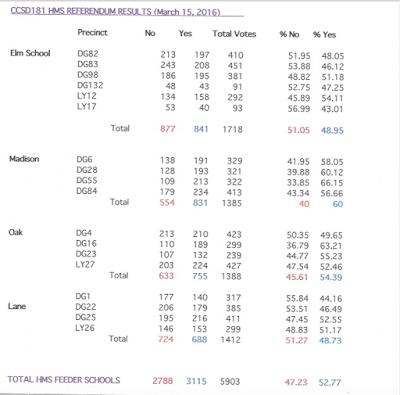 In the three schools that feed into Clarendon Hills Middle School, the margin was much wider, with between 65% and 75% of the voters casting a NO vote on the proposed referendum. A total of 2630 voters in the CHMS feeder boundaries did not support the referendum question to build a $65 million ($90 million with bond interest) replacement school and tear down the existing 40 year old school. 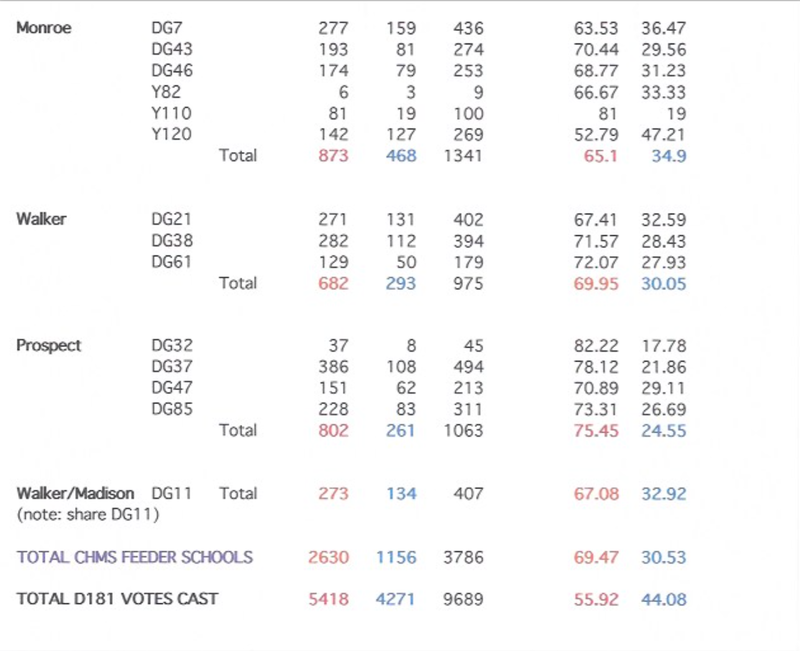 While the percentage margin of NO votes from the CHMS feeder schools was larger than from the HMS schools, the reality is that the combined NO votes from the CHMS feeder schools' precincts made up 48.5% of the total NO votes cast. That is LESS than the total NO votes cast from the HMS feeder schools' precincts. Moving forward, the D181 Administration and Board of Education must work with the Facilities Committee and ask the really hard question -- why did 5418 community members vote NO? No doubt, there will be vote YES supporters who will say that the election was lost because parents whose students have or will attend CHMS did not want to see their taxes raised for a school that will not benefit their children. Accusations were made before the election that a NO vote from CHMS feeder school voters would be a sign of being a bad neighbor, not supporting children and an unwillingness to reciprocate the YES votes cast nearly 20 years ago (in 1997) to build CHMS. But hopefully, the Administration, BOE and Committee members will not be so quick to jump to these ludicrous conclusions, since they will have to explain how 51.5% of the NO votes came from voters who live in the HMS feeder schools' boundary areas. Hopefully, these three groups will take the time to do a proper analysis and engage community members who voted NO to determine what it will take for them to change their vote to a YES vote. This engagement and analysis work, if rushed or done in a sloppy, slipshod fashion, will only lead to defeat of a future referendum, whether it is on the November 2016, April 2017 or March 2018 ballots. 400 people???? Really? In our opinion, a randomized phone survey of only 400 people is NOT going to provide the BOE with meaningful or statistically significant information as to why 5418 of 9689 voters chose to vote NO on March 15, 2016. If this is the type of quick information gathering that the Administration is proposing to the BOE as a first step, then we are not hopeful that a successful referendum will ever be achieved. Our hope is that on Monday night, the BOE will SLAP DOWN this ridiculous proposal and insist that the Administration start doing things right. * Note: Downers Grove Township Precinct 11 (in Dupage County) appears to have voters within both the Walker and Prospect school boundary lines (based upon the D181 Boundary map accessible at: D181 Boundary Map) so we have separated it out in the above chart.